Norm visits the Old Schwamb Mill in Arlington, Massachusetts. Built in 1860, the mill was purchased in 1864 by German immigrant woodworkers, Charles and Frederick Schwamb. The brothers did a brisk business crafting the oval picture frames which, at the time, were in demand to display photographs of Civil War soldiers. 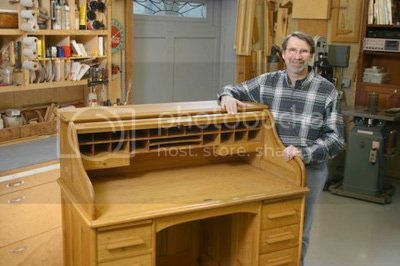 In the Schwamb Brother's old office, Norm spies a handsome, quarter sawn oak roll top desk, which inspires him to build his version of this American classic.